DVD Coming with No Subtitles? Rip DVD with Subtitles! You may encounter the following problem: when watching a foreign DVD movie, you find there is no English subtitle on your original DVD movie so that you can't follow the film at all. Even you're a native English speaker and not deaf or hard of hearing, you still can't make out what the actors are saying in English even with the volume turned way up and you replaying the dialogue over and over again. Accent? Talk too rapidly? Your kids voice too loud? The movie action decibel level overwhelms the actors' voice? Probably. In such cases, you learn to appreciate subtitles. Therefore, finding a professional DVD ripper which can help you rip DVD with subtitles preferred is the key. The first appears on your radar might be Handbrake. Yes, it can free rip DVD with subs (internal/external or force subtitles). What you need to note is that Handbrake doesn't have the ability to rip protected DVD. So as for ripping bought protected DVD, you're suggested to use MacX DVD Ripper Pro to copy DVD with subtitles. It's a 100% clean, fast and easy DVD Ripper to rip any DVD (including copy protected DVDs) to any video/device such as MP4, MOV, MKV, iPad, iPhone (X/8/7), Galaxy Note 8 and Surface Pro 4 with selected subtitles. That is to say you are allowed to choose preferred built-in subtitle track or add external subtitles to movies in mp4, mkv, avi and other ripped DVD videos. Free download top DVD ripper - MacX DVD Ripper Pro - to rip DVD with soft subtitles/forced subtitles or external SRT subtitles to help you see what they say. Both homemade and protected DVD supported, incl. Disney DRM-ed 99-title DVD, oversized 75GB DVD, Sony bad sector DVD, lionsgate DVD, workout DVD, etc. knowledgebase: to rip DVD with subtitles, you need to know the subtitle you rip is DVD internal subtitles (soft subtitles, hard subtitles and forced subtitles) or DVD external subtitles (usually text-based subtitles in .srt format). Generally, the closed caption is text-based subtitles used in TV programs for people who have hearing disorder and isn't often used in DVD disc. So here DVD ripping with subtitles, the "subtitles" doesn't include closed caption. If you wanna know more difference between closed caption and subtitles, you can scroll down to the last FAQ part to read on. Before getting the desired subtitles for the DVD movie you rip, you should download, install and launch the solid subtitle DVD ripper first. If you are Windows 7/8/10-based PC user, you can also download the windows version to convert DVD with subtitles on your Windows 10/8/7. 1. How to Rip DVD with Internal Subtitles? Click "DVD Disc", "Folder" or "ISO" button to import the DVD film and have it analyzed. If your DVD disc is slightly damaged or scratched, don't worry. This DVD ripper for macOS can still detect and analyze your damaged DVD and copy it without any error. Choose an output video format or device you'd like to rip DVD with subtitles to. This professional DVD ripper provides you over 350 preset profiles. Generally, this top DVD ripper program will automatically select the right title of the protected DVDs. Just open the drop-down list at the right of title column and choose one interna subtitle track you want. Tips: as the below picture shows, the subtitles labelled with Track 1, Track 2 or Track 3 stand for internal soft subtitles, which can be ripped from DVD as a separate text. And the hard subtitles don't display here, which are built-in with video images and can't be extracted from DVD movies as a separate text. If you just want to keep subtitles for the foreign language parts or the alien language and no subtitles for English parts, just select "Forced Subtitle" before converting. Once "Forced Subtitle" is chosen, subs will appear on the screen only when foreign languages (i.e. French, Spanish) are spoken. Hit "RUN" to start ripping DVD with subtitles you preferred. This DVD ripper software offers you two options: rip DVD with hard subtitles (subtitles into video image) or extract subtitles from DVD as a separate text file (most common scene). Afterwards, you can watch DVD movies in subtitles and follow the movie plot even though you're in a place with a house of kids, full of loud noise. 2. How to rip DVD with External Subtitles? If the DVD movie does not have a built-in subtitle track in your first language, you can still rip a DVD with subtitles by adding SRT files. Let's see how to do this. Find and download an external subtitle file online at Opensubtitles or Subscene by searching for the movie's name and the language you need. Of course, you can also create your own subtitles in text format, yet the precondition is that you need to know the precise time codes. Click "DVD Disc", "Folder" or "ISO" button to import the DVD film and have it analyzed. Then select an output video format or device you desired. Click "Edit" button (scissor-shaped icon) and choose "Subtitle". Then check "Enable Subtitle" and "External Subtitle File". All things done, click "Add" to browse and choose the SRT file you downloaded or created, and then hit "Done" to easily add subtitles to DVD movies. Click "RUN" button to rip and copy DVD with subtitles you preferred. * Download SRT editor software like SRTEd, SubtitlesSynch, Easy Subtitles Synchronizer, Subtitle Workshop, etc. to adjust your subtitle video synchronization problem. * Use free video player VLC media player to solve ripped DVD video subtitle not syncing problem. Check the detailed steps. Notice: We only advocate using this fabulous Mac DVD ripper to rip DVDs with subtitles under the fair use, instead of illegal reproduction or distribution of copyrighted content. Please obey your local DVD copyright law before doing it. DO NOT do harm to others' lawful rights and interests. What is the difference between closed caption and subtitles? To put it simply, subtitles appear only when the character speaks while closed caption displays for every sound, not only the charaters, but also the sound from objects like stone rolling sound, blasting sound, etc. So closed caption is mainly designed for those who have impaired hearing. How do I turn off the DVD subtitles? You can turn off DVD subtitles when you play the DVD movie on your DVD player by "Settings" > "subtitle language" > press right arrow > click up arrow and down arrow to select "none" > choose exit. Or, you're able to disable DVD subtitles in the MacX DVD Ripper Pro after you import the DVD source into it. How do add srt subtitles to an mp4 file? That's really simple. Handbrake is a nice choice for you to free add srt subtitles to MP4 video. What's more, the all-round MacX Video Converter Free is also a free software for you to free add subtitles to mp4 video. How to rip copy protected DVD for free? 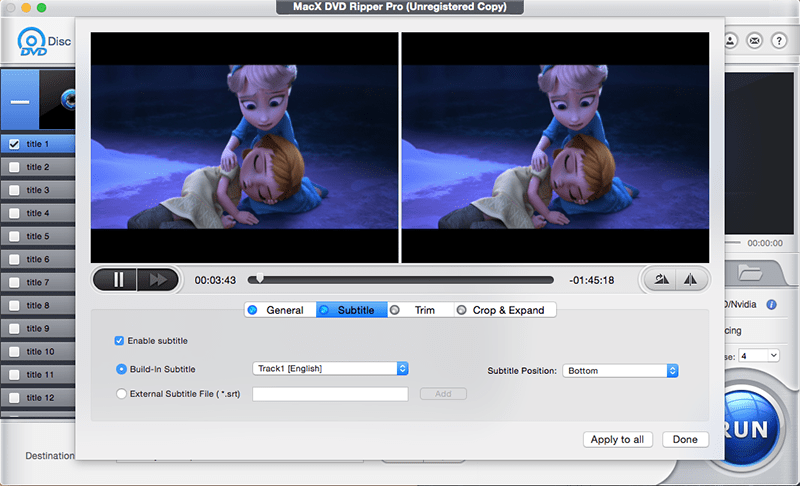 The top encrypted DVD ripper for Mac from MacXDVD is an ideal solution to rip copy encrypted DVD movies on Mac (macOS High Sierra) by stripping off the DVD copy protections. Rip protected DVD for free to Mac, MP4, MOV, FLV, MPEG, iTunes, MP3, etc. The answer to add .srt subtitles to MP4 file can be found in this article, which introduces a hassle-free solution to merge .srt external subtitles with MP4 files so as to make your downloaded movies, videos or recorded clips understandable with the aid of MacX Video Converter Pro. The desire to add subtitles to MKV file is still on the rise. If you are still in the dark place to hardcode subtitles with MKV movie video, this guide will be your right place, sharing two ways to attach and merge SRT subs to MKV with highest possible quality. 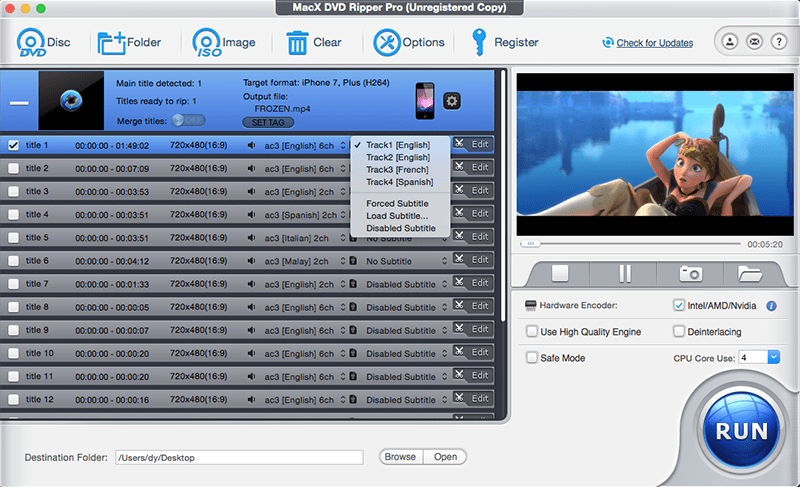 MacX DVD Ripper Pro is the best DVD ripping software which will help you choose preferred built-in subtitle track or add external SRT subtitles to movies. It also can easily remove any DVD copy protection and convert DVD to various video formats (MP4, MOV, MKV, AVI, FLV, etc) and portable devices iPhone iPad Android Microsoft, etc. with original quality.